One big question that many motorists have is how the officers can pull you over. Do they need a reason to do so? In other words, can a cop pull you over for no reason? The answer to this question is kind of complicated, but it starts with a simple answer of no. An officer cannot pull you over for no reason. In order to make a traffic stop of your vehicle, the law in the United States says that an officer must have a valid reason to do so, but it’s more complicated than that. The basic law for stopping a vehicle is that a cop has to have reasonable articulable suspicion that you have broken the law or that other criminal activity is afoot. What does that mean? Well, the simple answer is things like traffic laws for speeding or registration or swerving over a line. Those give the officer a reason to pull you over. That’s a simple clear-cut example that everyone understands. Where it gets complicated is in things that big catchall of criminal activity being afoot. What exactly does that mean? What that means is that if the officer based on his training and experience can testify and point to several things that he thinks meant that there may be some criminal activity going on, he can still pull you over. A good example from might work is that if you’re swerving within your lane in Virginia an officer can pull you over for suspicion of DUI. Even though it’s not illegal to swerve within your lane as long as you’re maintaining your lane of travel and not crossing over either line, if you swerve several times within your lane an officer can testify that based on their training and experience that means that you may have been under the influence of something, and therefore, they can pull you over to investigate. How else can an officer pull you over? One easy example is if they run your plates. This can give them a reason to stop you. A cop can definitely stop you after running your plates if the return in the computer shows a problem. 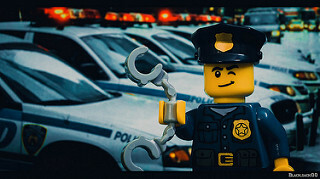 For example, if the registered owner of the vehicle has their license suspended and if you match the general description of the registered owner, an officer now has reasonable suspicion to pull you over to see if you are that person and if you’re breaking the law by driving on a suspended driver’s license. The same could be said if the registered owner has an open warrant for something or if perhaps the registration is dead and doesn’t match the tags that are displayed on the car. As you can see, a cop can pull you over for many reasons. They can’t pull you over for no reason whatsoever, but there’s a lot of different things that can get you pulled over depending upon what’s going on in your specific case. This is why it’s important to maintain proper registration, inspection, if required in your state, any other decals such as county tax decals that might be required. It’s also important to obviously make sure that your vehicle has proper and safe equipment and no unauthorized equipment such as an after-market loud muffler. Another thing that gets people pulled over at least in Virginia is having what they call a dangling object on your rear-view mirror. The law is clear that a dangling object can get you pulled over, and if an officer is fishing for a reason to stop you, that is just enough reason for them to pull you over legally. While a cop can’t stop you for no reason, there’s many, many reasons why an officer can pull you over so the best rule of thumb, of course, is to not break the law, to not have anything to hide. However, if you’re pulled over and an officer starts asking you questions or asks to search your vehicle, I always recommend that you do not answer questions politely and that you never consent to a search of your vehicle.